Mobile phone shop on North End. 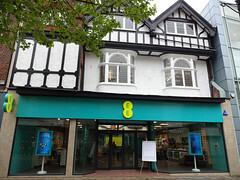 It moved from number 85 next door in May 2016. According to London Footprints, this building was once the Rising Sun pub. A rising sun bas-relief photo is still visible between leaded bay windows photo on the first floor. According to a photo on Flickr, as of c. 1988 the premises were occupied by a branch of Wimpy. By December 2011 it was Burger King photo, but this closed in early 2014, with the premises completely stripped out by late March of that year photo and notices in the window photo directing people to the nearby branch at 41 Church Street. Vacant as of August 2014. Still vacant as of July 2015. Still vacant as of early January 2016. Still vacant as of April 2016, but with a poster stating that it'd be opening soon as a branch of EE photo. Existence last checked in July 2018. Find all things within 500 metres 1 kilometre 1.5 kilometres 2 kilometres of here. Last edited 2019-01-08 16:00:51 (version 49; diff). List all versions. Page last edited 2019-01-08 16:00:51 (version 49). Powered by OpenGuides 0.82. This guide is in read-only mode. The textual content of this work is licensed under the Creative Commons Attribution Non-Commercial Share-Alike 2.0 licence. Photographic content remains the property of the original photographer, and is used here either under Creative Commons or by permission.